This disc is great value, in terms of quality and quantity. The well devised programme is designed around the talents of the twin-sister piano duo from Istanbul, Güher and Süher Pekinel. Such is their musical empathy, that the glamorous pair play (we are told) back to back, rather than either facing each other or side by side as is more usual in piano duos. Odd though this may sound, it makes a great deal of musical sense, and certainly there are no signs of raggedness or uncertainty in their playing. The �pop� number here is, of course, Camille Saint-Saëns� wonderful �Grande Fantaisie Zoologique�, The Carnival of the Animals, and it is given a splendid and far from routine performance. Some listeners, used to more pantomime, may find it a little po-faced � Pianists, for example (track 11) is played very straight � but my feeling is that if musical jokes are any good, they don�t need to be shoved down the listener�s throat by being turned into cheap slapstick. A little Gallic �cool� is welcome here. More seriously, some of the tempi are very quick, which is bracing, yet occasionally gives the detail of the music less time to make its impression. On the other hand, the performance of The Swan by cellist Éric Levionnais is the most beautiful I have heard � deeply expressive yet subtly understated. It is no disrespect to the other performers to say that this track is on a higher level even than the rest of this accomplished disc. In sum, I enjoyed this �Carnival� for purely musical reasons far more than I am used to doing. There follows one of the great masterpieces for piano duet, the Poulenc D minor Concerto of 1932 - though for me this disc would have worked better if the Poulenc had been placed at the end. Again, the tempi are extremely quick in the opening movement and the finale. But the twins play with tremendous gusto and panache, and all the notes are firmly in place, while Janowski and his orchestra are well up to the challenge. This is a glistening rather than a thoughtful performance of this quite enigmatic piece. Yet the slow music is projected with great clarity, with the result that the remarkable textures, featuring such rarities as double bass harmonics and the bottom notes of the piccolo, come over superbly. There now follow three works for piano duo without orchestra. Manuel Infante�s music was new to me, but these �Andalusian Dances� are great fun, and are characterised sharply by the Pekinel sisters. 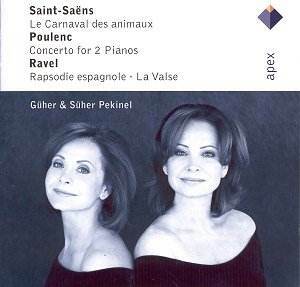 The disc is completed by two Ravel masterpieces, both better known in their orchestral garb. The first, Rapsodie Espagnole, is in four movements, of which only the third (Habanera) was originally composed for two pianos. The rest were transcribed some years later, yet sound utterly convincing. Ravel had such a genius for texture and sonority that there is no possibility of these, and La Valse that follows, being anything other than total recreations of the works in question. The Pekinels are at their very best here, whether in the mysterious opening Prélude à la nuit of Rapsodie espagnole, or in the wild, panic-stricken closing pages of La Valse. This is a fine CD; the recording for the two pianos alone is just a little boxy, though not enough to be a serious problem. That of the works with orchestra is first-class.